The 6 keyworks of PHP Every Developer should know. In PHP there are 6 keywords that is more important for any developer who use Object Oriented Programming for building PHP web pages. The first 3 keywords are related to each other in a manner of how they operate in providing access to the properties and methods inside the class they are used. 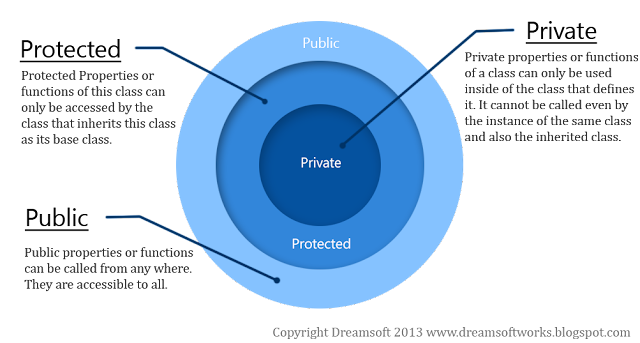 As shown in the above image, private is at the core of the accessibility. It means that private properties (i.e. variables) or functions inside a class can only be access inside the class that defines it. It cannot be accessed by the instance (i.e. object) of the class or by the instance of the classes that inherits this class as its base class. You also cannot access them via the class name with the scope resolution operator style (className::$property). Protected is at the next level of the private accessibility. The properties and function with protected visibility can be accessed only within the class that defines it and the class that extends it i.e. the class that inherits it. Only the inherited class can access can access those properties and functions. Public visibility properties and functions can be accessed by any object of the class and also the class that inherits it. If a function is declared static, then like the static property the function is class dependent and not object dependent. There are rules for using the static function. It can be accessed using className::function() notation. $this keyword cannot be used inside the static function since it is not object dependent. Because $this represents a specific instance of the class. If a property or function is defined with final keyword, then the property value cannot be changed and if it is a function, that function signature cannot be overridden or changed. Class declared as abstract cannot have any instance i.e. object declaration. Functions declared as abstract must be placed inside the abstract class only. Class containing a single abstract method should be declared as abstract. Abstract class is used for inheritance.